Steve McQueen was a star prison escapee after The Greatest Escape in 1963. Ten years later he would once again play a determined and dedicated prisoner, unwilling to give up the fight for freedom regardless of the cost. 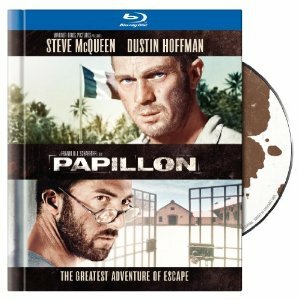 Based on the novel by Henri Charriére about his years spent on Devil’s Island, a prison in French Guiana, McQueen plays the author who was known as Papillon during his incarceration. It means butterfly, which is tattooed on his chest and serves of a reminder of freedom. Paired with McQueen in this buddy escape film is Dustin Hoffman as Dega, a pathetic looking prisoner with large eyeglasses. The two of them join forces in the attempt to escape the hellish island, though there are many more obstacles than the normal prison escape film. Rather than walls and prison guards, there are many more dangers within the wilderness of the island that are even more difficult to escape from. The beauty of this film is the dedication the storyline takes to a simple idea of freedom. The film is epic in scale, especially as far as the characters are concerned. We follow them through such ordeals that it is impossible not to root for the smallest of accomplishments in the task of obtaining their one goal. Director Franklin J. Schaffner approaches the subject with a realistic touch, leaving the escapist nature for the characters onscreen. The Blu-ray includes an incredible high definition presentation of this classic, as well as the theatrical trailer and a featurette about McQueen. The Collector’s Edition Blu-ray book also includes 32 pages of photos, essays and trivia.